They want to destroy our human identity. This is what we must fight. When she was arrested, her only ‘crime’ was that she was the sister of Massoud Rajavi, the leader of the Iranian Resistance. Her daughters, Maryam and Marjan, were also arrested together with her. Monireh Rajavi spent the next seven – and final- years of her life in the mullah’s prison. The interrogators and torturers subjected her to every conceivable pressure – physical and psychological- to force her to denounce her brother and the PMOI. Other inmates, also victims of brutal torture and abuse by prison guards, were shocked by the henchmen’s brutal treatment to Monireh. For months, Monireh and other political prisoners were tortured in front of her two daughters. In 1985, her husband, Asghar, was executed. But this did not break her resolve. In the absence of any charges, the judge sentenced her to two years ‘imprisonment in a trial which lasted a few minutes. But she was never released and five years after completing her sentence, she was executed in 1988. Monireh studied Persian literature at Mashhad University in the early 1970s. She went to the UK to continue her studies at the University of Newcastle. But in 1971 when the Shah’s dreaded secret police, SAVAK arrested of her youngest brother Massoud, a wind of change hit her life. Monireh devoted all her time and energy to campaign and expose the crimes perpetrated by the Shah’s regime in a bid to save the lives of political prisoners, in particular her brother Massoud, whose execution was imminent. She joined Amnesty International in Newcastle and together with other Iranian students, formed the “Committee against Repression in Iran”. She published several booklets on the situation of political prisoners in Iran. Another prisoner wrote: “They took Monireh for interrogation on March 9, 1984. We were very concerned because this was the second time they had taken her away and then to the court where they issued a verdict. She returned to the cell that night. She said they had taken her to visit Asghar (her husband). She was carefully choosing her words to no disturb us with the news that Asghar as on the verge of being executed. 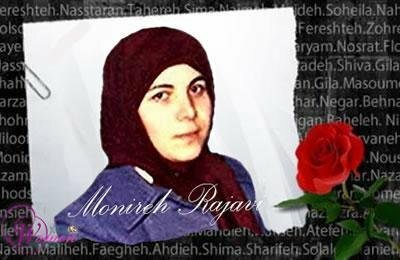 Monireh was executed in 1988, during the massacre of 30,000 political prisoners in a matter of a few weeks. Mullah Nayyeri, Evin Prison’s religious judge, personally followed up her execution, insisting that it must be done as quickly as possible. Monireh was 38 at the time.